Auburn’s Briar Jakes, 3, attempts to block the shot of West Side’s Jake Burdick, 5, as Eagle teammate Jacob Nave, 23, looks on. The top seeds had to answer stiff tests against upset-minded teams and both were up to the challenge as No. 1 Woodland and No. 2 Auburn earned semifinals wins and will play for the 2010 Cannon County Cancer Tournament championship at Woodbury Grammar School Saturday at 7:45 p.m.
Woodland (11-0) continued its undefeated season with a 45-34 win against East Side (4-5) in the first semifinal, and Auburn (10-2) assured the anticipated championship showdown with a 50-34 win against West Side. East Side and West Side will play in the boys consolation game at 5:30 p.m.
"We did not play one of our better games tonight," Woodland coach Kendell Smith said. "Our guys know that. The Auburntown game was close the first time we played (three-point win at Auburn) so our guys know they have to play better if they want to win this championship." Auburn first-year coach Regan Vaughn said her team is excited about another shot at Woodland after the near-miss at home two weeks ago. 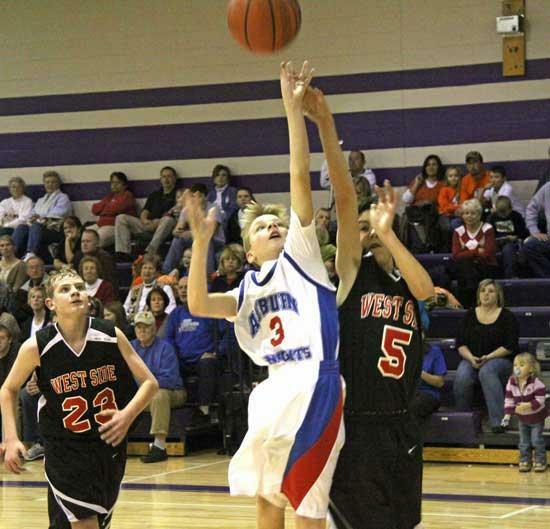 Knights' eighth-grader Garrett McReynolds scored 28 to lead Auburn. "We are very excited about meeting them in the championship game and on a neutral floor," Vaughn said. "Woodland is a very good team and they are well-coached so we have to play well, but the boys have been improving with every practice and it has shown in the games. I'm proud of all of them." Woodland players said they learned a valuable lesson and got away with a less than stellar effort in a 45-34 win against No. 4 seed East Side. "We should have played better," said Warrior eighth-grader A.J. Daniel, who scored 12 points in the win. "We didn't come out ready to play. We didn't play our best game, but we won. Our team will learn from this." They almost learned a painful lesson against coach Kayla Hindman's squad, who pushed the Warriors to the limit before coming up short down the stretch. Josh Ruehlen led Woodland with 15 points, Daniel tallied 12 and Jackson Mason contributed six. East Side standout Jake Hoskins followed his 38-point performance in the quarterfinals with an impressive 25-point outburst in a near upset against the Warriors. "Jake is the kind of player who can keep a team in the game and he was on in this game," Daniel said. "We left him open for some shots and he will usually hit those." Hoskins' 3-pointer from the top of the key pulled East Side to within 36-34 with 4:41 remaining, but Mason and Ruehlen keyed a 9-0 run in the game's final 4:20 to avoid the upset. Uncharacteristic turnovers were the chief culprit. "We had 16 turnovers tonight and we have not had that all season," Smith said. "We spent the last practice working on this, just making the easy pass and we come out here and throw it all over the gym. Our players know they didn't play as they are capable and we were lucky because East Side was ready to play." Hoskins came up with several clutch shots throughout the game, including his 3-pointer with less than two minutes remaining in the third quarter to narrow the Woodland lead to 27-26. In a game of runs, Woodland closed the frame with a 7-0 run started when Wilder Mankin came up with a steal and layup. Daniel added a 3-pointer and two free throws to send the Warriors into the final quarter with a 34-26 advantage. Kyle Fults and Hoskins opened the fourth quarter with 3-pointers for East Side, which closed to within 36-34 on Hoskins' trey at the 4:41 mark. Mason pulled a key offensive rebound and stuck the putback to extend the Woodland lead to 38-34. He hauled in another offensive carom one possession later and East Side center Allan Robinson, who scored six points, would eventually foul out during the additional possession. Robinson's absence left the middle open for Mason to muscle his way to key rebounds and control the paint. Ruehlen scored a layup off a feed from Daniel, following a steal and, following an East Side miss, came back with a clutch 3-pointer to send Woodland to a 43-34 lead with 2:42 remaining. Woodland turned up the defensive pressure in the waning minutes to survive the scare. Garrett McReynolds felt helpless sitting on the bench with two fouls as his No. 2 seed Auburn team trailed No. 3 West Side 12-7 in the second quarter of Thursday's second semifinal in the 2010 Cannon County Cancer Tournament. "I was thinking this game was a replay of our tournament game against them and I didn't want to let my team down," said McReynolds, referring to a 41-31 loss against West Side in the preseason Border Wars Tournament. "I felt like I had to do something about it." Trailing by five, Vaughn rolled the dice and put McReynolds back in the game with his two fouls. He dominated the remainder of the half and avoided his third foul to turn the game in Auburn's favor for good. McReynolds finished with 28 points to lead all scorers. Reagan Scott scored 10 and Briar Jakes added nine for Auburn. West Side was led by Jacob Nave's 10 points. Collin Anderson and Walker Hatfield netted eight each for the Eagles. "West Side came out ready to play so this was a hard-fought win for us," Vaughn said. "Garrett McReynolds is the leader on the floor and the boys feel confident with him in the game. He worked his heart off because he knew we needed him." McReynolds was lights out as he led the Auburn charge. The budding star shot 10-of-11 from the field and hit his first 10 attempts in succession. He was 4-of-4 from 3-point range, as well as the free-throw line. He was virtually unstoppable in helping the Knights avenge their earlier loss against West Side. They will attempt to avenge the other in Saturday's championship. "I have to say my teammates are the reason I was able to hit a lot of those shots," McReynolds said. "They got me the ball when I was open and they were boxing out, rebounding and kicking the ball out for second chances. I just had the hot hand." It was not easy. Coach Roger Haley's Eagles led 7-4 after the first quarter and extended the lead to five in the second quarter before McReynolds scored eight consecutive points to stop the run. West Side led 21-19 at halftime. Auburn used a 14-7 third-quarter run to take advantage and controlled the game throughout the fourth quarter to reach the championship game. Way to go Auburntown !!!!!!!!!!!!! GO AUBURN!!!!!! We are so proud of you!!!! Good job Warriors. Keep up the good work and stay focused. You can do it. We are very proud of you all! Lets go on Saturday and bring in 2 trophies!!!!! What a great year for Auburntown!!! Way to go boys and girls!! You look Great! !